After a busy summer at work so far, I now have two days off work. Which is great! The weather in Norway is amazing! It's so warm, that I'm all confused. It's Norway. We rarely have weather like this. So I should really be outside and enjoy the weather. 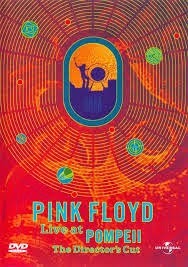 But I got stuck in my couch with a beer and Pink Floyd Live at Pompeii dvd. Well, that ain't wrong either. Lately I've listening to loads of different music, so today I felt that I missed Pink Floyd. So what way to make it better, than put on this dvd? Hell if I know. So that is what I'm gonna do this thursday evening. This dvd is one of my favourite live PF dvd. You get to see them play a few really great songs, and also some scenes with the four great men. They are all sitting on a cafe and doing nothing special (exept try and order crustless pie - that's you Nick!). They just sit there and talk. They also get interviewed. By wathching this dvd, you get a bit of everything. I remember laughing a lot the first time I watched this dvd. They are all so charming and funny. I'm still laughing to be quite honest. The dvd makes me happy! And it makes me want to watch all the pink floyd dvd's and listen to all the different albums. 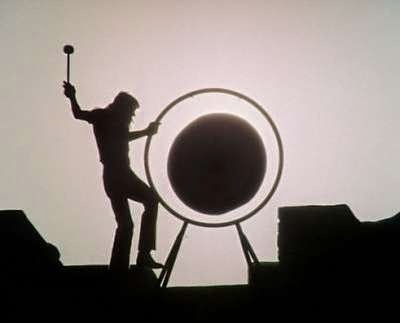 So on my day off work tomorrow, I will enjoy as much Pink Floyd dvd/music as possible. That is what I call a day off work. 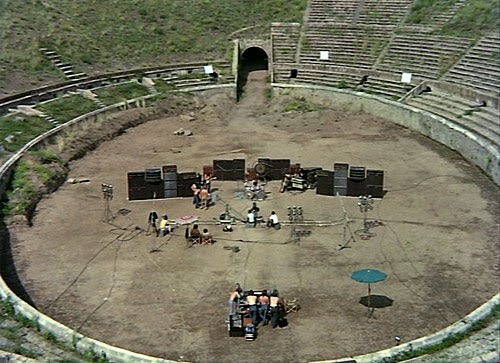 Live at Pompeii is a 1972 live dvd/documentary, and as you all probably know, it's filmed in Pompeii (Italy). Pompeii is a place I've always wanted to visit. From my days in primary school, volcanoes has facinated me. And to go to a place which was buried in after a volcano eruption, AND where my favourite band have been, would blow my mind. I've been talking about going there for years! And someday I will go. It's on my bucket list. A brilliant thing about the part of the movie where they perform their songs, is that there are no audience. So no screaming and cheering (no one like me that is). So you get to focus on the music and the band. There is no one there to disturb the fab four in acton. The interviews are not filmed in Pompeii. They are filmed at Abbey Road Studios. The dvd was re-released a few years after with the interviews and some parts of the band working on "Dark side of the moon". That is the dvd I'm watching now. And now I will have to pay more attention to this dvd, so I'm gonna end the blog here today. I will upload a few youtube clips for you all to enjoy this thursday evening. From the song "A saucerful of secrets".